1988. Secundino Vazquez Gomez, purchased his first refrigerated truck, a “Pegasus 360″. 25-10-1996. 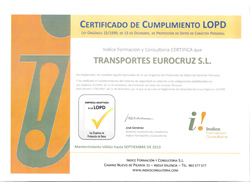 Eurocruz S.L. is created. 1997. Pioneering use of Eurotunnel, linking France and England. 2005. Secundino Vazquez Gómez‘s sons, Eleuterio Vázquez Díaz and Jose Antonio Vázquez Díaz, join him. 2006. Eurocruz s.l. gets a Calidad ISO 9001:2000 certificate from AENOR. 2007. Strong commitment to improving the environment by reducing CO2 emissions that our trucks emit into the atmosphere. Increasing the crossing by Ferry (Cherbourg, Ouistreham, Poole, Portsmouth, Santander, Bilbao ) and Train (Calais and Dover). 2011-2012 Award and special mention Ecological European Transporter awarded by International Produce Ltd (ASDA). 2013. Inauguration of the present facilities. Equipped with Phone, Mail and GPS. Reading information of Cooling machine. Service brands across Europe. 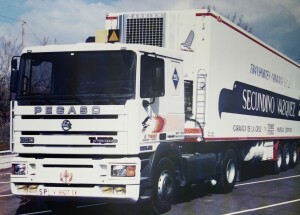 Scania, Iveco, Renault. 20 km from Campo de Lorca. 50 km from Campo de Cartagena. This managed to reduce our response time on loads, satisfying our customers. We’ve got our own garages. We’ve got our own Diesel A and B suppliers.